Success! 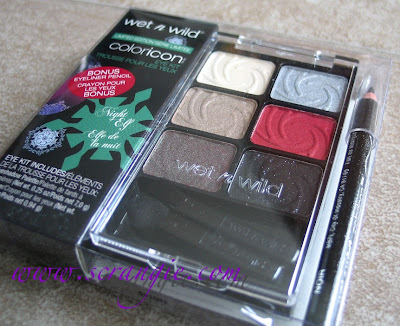 I finally found the rest of the Wet n Wild Holiday palettes! When I first saw them, I passed them up completely. The store lighting made them look blah and I didn't think twice about them. Then, I saw them on a much prettier, better-lit display and Night Elf jumped out at me- I didn't notice the brown/green Club-esque duochrome before! 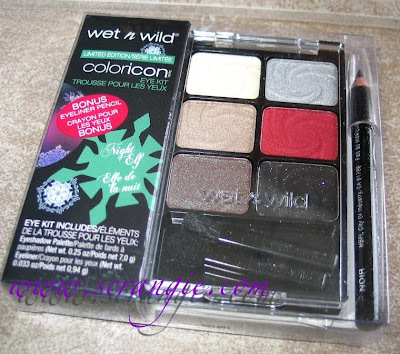 I didn't get the others because the last Wet n Wild palette I bought was a disappointment (I swatched it but never posted it, I'll have to remind myself to try it again...). After trying the Night Elf palette and being super impressed by it, I really wanted to try the ones I originally skipped. But, of course, when I went back looking for them, they were all gone! Took quite a bit of searching but I eventually found them and I'm glad I did. But this palette is totally not stupid. It is kinda awesome. This is what the packaging looks like. It's a six shadow palette with a coordinating eyeliner pencil. The colors are a sheer white shimmer, a sorta taupey-dirty gold, a red-toned brown with green duochrome a la MAC Club, a metellic silver, a red with subtle shimmer and a black with silver glitter. The eyeliner is also black with silver glitter. This angle shows the glitter and the duochrome shift pretty well... Really pretty in real life! Check out the green shimmer! Slightly different angles and lighting to show the duochrome on the brown. The last swatch on the end there is the eyeliner- the glitter is pretty subtle. I did two looks with this palette so far. Unfortunately, these had to be taken with flash and fluorescent light because it gets dark so early now. The colors are a little too orange and they're a little blurry. Eek. Tried to show the green shift in these pictures. It's really obvious on the lower lash line! Such a cool color. It seems like I own 4 or 5 versions of this color but I never seem to get tired of it. Look at that long squiggly hair about to poke me in the eye. I really need to cut my bangs. This look was done using nothing but my fingers to apply the shadows. 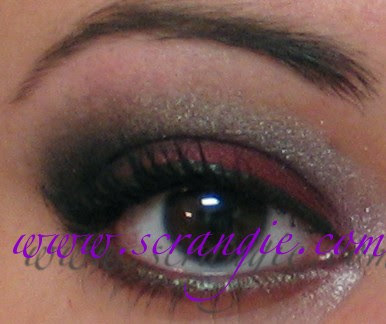 This inspired by a look I did last week using all Lancome shadows applied with my fingers. I thought it turned out really pretty and wanted to try again. 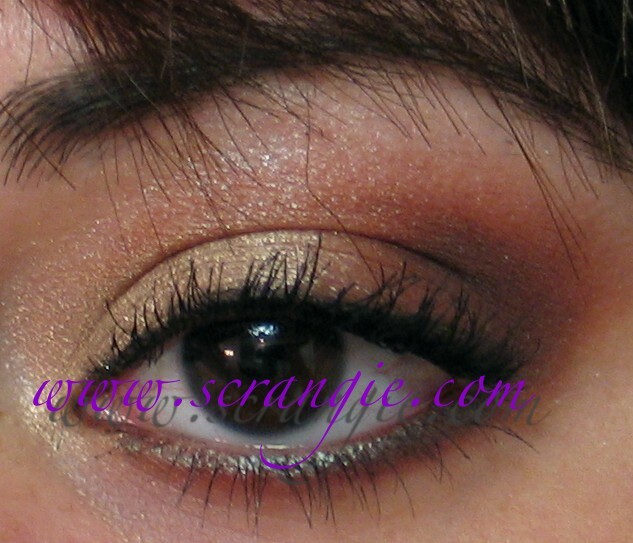 This was the dirty gold shade on the lid, the green/brown on the outer third of the lid and on the lower lash line and the white shimmer as a highlight. I used the black eyeliner that came with the kit as well. This one used the red on the lid, the black in the crease (the glitter actually shows up! 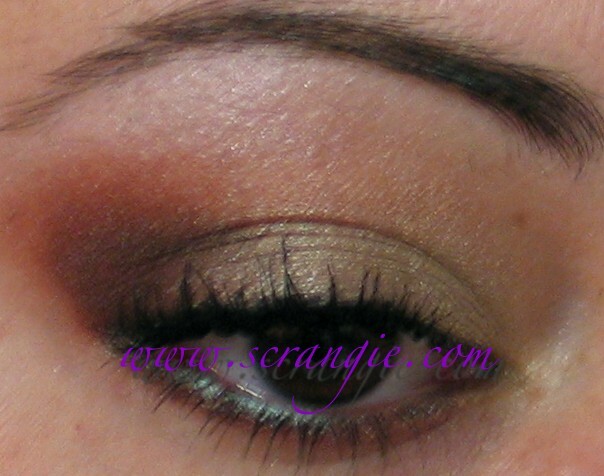 ), the silver and white in the inner corner, the green/brown on the lower lash line and the white as a highlight. Urban Decay Oil Slick liquid liner. It's weird, in the blurry fluorescent light pictures it looks like there's a ton of silver shadow under my eyes but I did not notice it in real life, only in these pictures... Hm. That's no good. The red is slightly darker than I normally like my reds to be, but it has this really pretty subtle strawberry colored shimmer that I just love. It doesn't look that opaque swatched on my arm, but it applied a lot better on my eye over Too Faced Shadow Insurance. I was worried it would be patchy. I thought the quality of these shadows was great for being so inexpensive. They were really smooth and the pigmentation was surprisingly good. I didn't have to layer at all to get the amount of color I wanted. They blended perfectly as well. I don't really expect that kind of effortless application from such a cheap brand, so yeah, very happy surprise. The only thing that distinguishes these from a more expensive shadow is that the color does tend to fade/mellow after a few hours. I always wear a primer and I don't normally notice color fading with my eyeshadows. I love this palette, but I think I might love the gold-colored "Golden Goddess" ColorIcon palette even more... I'm completely shocked by this because Wet N Wild never used to make good, pigmented shadows back in the day and now their quality is almost on-par with some of the higher-end shadow brands I love! Oh! And before I forget, since it was asked- the Cover Girl Lash Blast I use is the original in the orange tube. I'm still working on the blogger-not-letting-me-comment-on-my-own-blog issue, but lovely reader Mira has been helping me out with it- I hope to have it straightened out soon so I don't have to keep using Twitter to reply to questions. I'm not into red eyeshadows. But the rest of the palette looks great! I saw a full display of these at the grocery store, my interest is perked up! The cover Girl mascara cost $5 at walmart (special price) thx for remind me its the orange tube and not the purple :) Also thx for the swatches, i want this shadows asap! I love this!!! 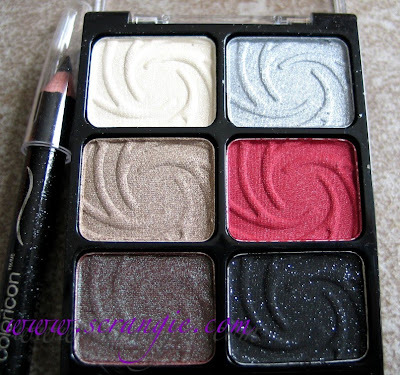 I have been searching everywhere for this palettes and I still cannot find them! 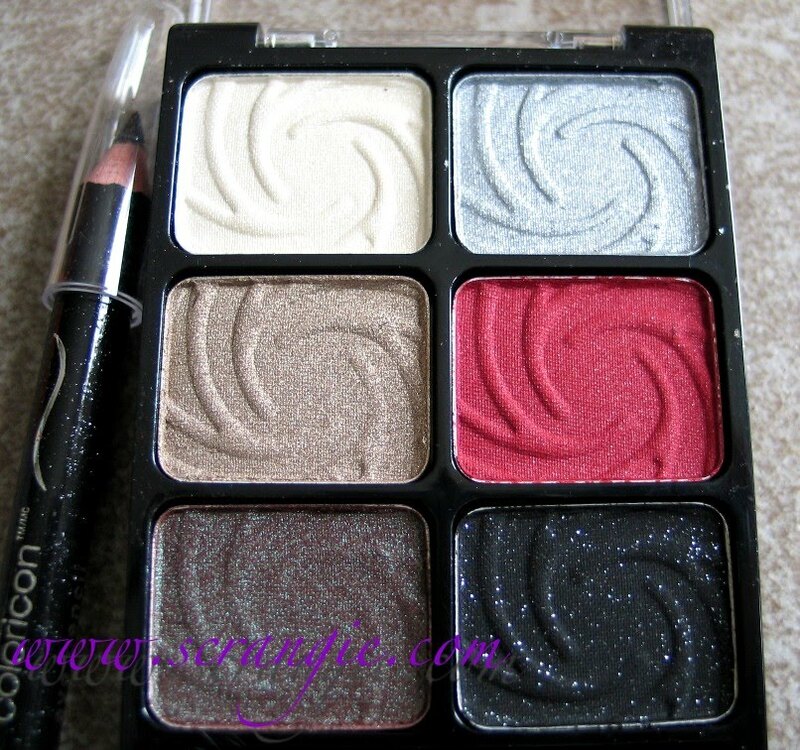 This is a beautiful palette! 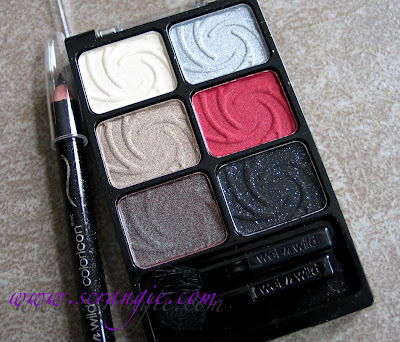 You did your eyes so pretty as well... Hope to find this palette in our counters soon.. I had my bestie pick up one of these for me. They're so pretty!! I love the brown with the green shimmer. Wow, your makeup is beautiful! 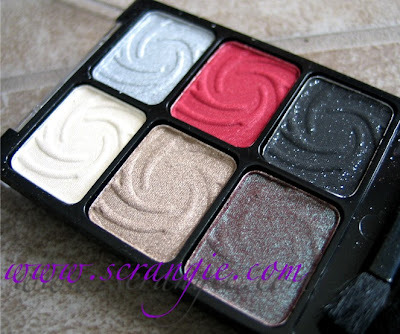 I never would have thought that those palette would give such a wonderful pigmentation! I bought this one and the Sugar Plum one and this one was definitely my favorite. Best 5 bucks I ever spent. Also, if you check Walgreens' right now, they are half off, or mine was. I have this very same one and I did a look similar to the first one.. I loves it so much! My only question is how did you get the red so vibrant in the second look?? I have to admit I had to go to a few Walgreens to find these palettes also. These look lovely on you. I grabbed the Sugar Plum Fairy palette but haven't tried it yet. If you haven't tried it yet, BE Bad Kitty is a lovely red shadow. I don't judge at all...I've been to 9 different stores so far looking for Sally Hansen Grey Area nail polish. I actually saw these shadows and didn't realized it had red in it...I have to go back for it. I often use WnW palettes...not too shabby for the price. I'm so surprised by the quality of this palette - wasn't expecting the pigmentation to be as good as it is. Your 2nd eye look is amazing! Love how you incorporated a bold red! I've always bypassed this brand. Just this year I've bought WetnWild polish. I really like it and am suprised by how long it's lasted on me. Now I guess I'll have to try the shadows. I absolutely love that first look! So freaking pretty! I haven't been able to find these holiday palettes in my area yet. I gotta have that brown duochrome color. It reminds me of a shadow I used to have, but lost...Too Faced shadow in Label Whore! I was wondering what you would describe your skin tone as, I love the looks you made with this palette but I have very light porcelain skin so I've always thought bold red shadows would look too harsh on me.